Premium quality ceramic cookie jar. 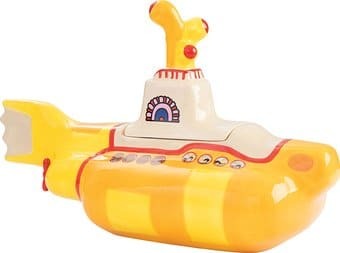 As you may not know, the Beatles were very much method songwriters, and while they composed Yellow Submarine they became a tasty bag of shortbread cookies living in a jar beneath the sea...this is an exact replica of said jar...now all you need is love and cookies...and the band begins to play. Product Dimensions: 15" x 7" x 9.25".